When you customize the Microsoft Dynamics 365 command bar, you can configure commands for controls that you add. These commands contain rules that control whether the control is enabled and what action is performed when the control is used. For more information, see Customize commands and the ribbon. We recommend that you use jQuery together with HTML web resources to provide user interfaces because it is an excellent cross-browser library. With HTML web resources, you control the libraries that are present and there is no restriction against manipulating the DOM. Feel free to use jQuery within your HTML Web resources. We do not recommend using jQuery in form scripts and ribbon commands. Using $.ajax to perform requests against the Microsoft Dynamics 365 web services is supported, but there are alternatives. The alternative to using $.ajax is to use the browsers XMLHttpRequest object directly. The jQuery $.ajax method is just a wrapper for this object. If you use the native XMLHttpRequest object directly, you do not need to load jQuery. Following Microsoft Dynamics CRM Online 2015 Update 1, form scripts run in a different scope than the jQuery instance used by the application. This means that there may not be an instance of jQuery available when your code attempts to use jQuery.noConflict. If you must use jQuery, you should first detect whether an instance of jQuery exists before you attempt to use jQuery.noConflict. Because you don’t know what browser will be in use, you should make sure that any scripts that you use will work with all supported browsers. Most of the significant differences between Internet Explorer and other browser have to do with HTML and XML DOM manipulation. Because HTML DOM manipulation is not supported, if script logic is only performing supported actions and using the Xrm.Page API the changes required to support other browsers could be small. Use the Custom Code Validation Tool to identify code that only works for Internet Explorer. Because Microsoft Dynamics 365 (online & on-premises) supports W3C standards, the application will be accessible using any modern browser and from any platform that supports those standards. However Microsoft Dynamics 365 will only be tested using a specific set of browsers and platforms. For the list of supported platforms and browsers see TechNet: Supported web browsers. If you use a browser, or browser version, that is not supported and you type just the server name or server name with organization as the URL, you will be redirected to the Microsoft Dynamics 365 for phones page. The Dynamics 365 for phones pages can be expected to work properly on most browsers, such as browsers used in mobile devices, with limited functionality. On the Internet, you can find many examples or suggestions that describe using unsupported methods. These may include leveraging undocumented internal function for page controls. These methods may work but because they are not supported you can’t expect that they will continue to work in future versions of Microsoft Dynamics 365. Use the Custom Code Validation Tool to identify code that is using unsupported methods. We do not recommend or support using jQuery for any pages within the application. This includes form scripts and ribbon commands. More information: Use of jQuery. Some organizations will restrict Internet access for employees. Unless they configure the network to allow access to the CDN library sites, your code may fail for those organizations. Even when you use a cross-browser library like jQuery, you need to be very aware of differences between browsers. You can generally detect which browser is being used by querying the navigator.useragent property. This is called browser detection. Browser detection is not a good strategy for most cases because it can’t take into account what features newer versions of a browser have. Also, some browsers provide the capability to modify the navigation.useragent property so that they appear to be a different browser. Feature detection is the recommended approach. By detecting what features are available, you can create code paths for the browsers you support without knowing exactly which browser is being used. For more information about feature detection, see How to Detect Features Instead of Browsers. When you access data by using the Microsoft Dynamics 365 web services, always use an XMLHttpRequest that is configured to execute asynchronously. The reason is that the browser operates on a single thread. If that thread is being used to execute a long-running process synchronously the browser will stop responding. Each browser provides some kind of debugging extension. 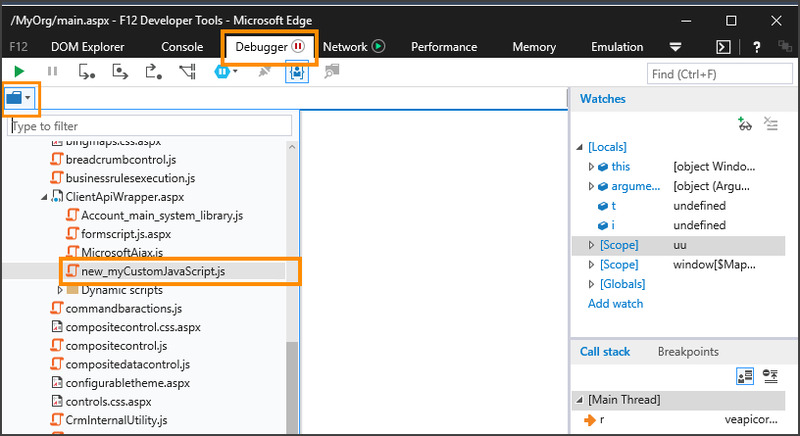 Internet Explorer provides developer tools you can use to debug scripts in Microsoft Dynamics 365. The Internet Explorer developer tools can be opened by pressing F12 when viewing a page using Internet Explorer. For more information, see Using the F12 developer tools. For Google Chrome, press F12 to open developer tools. Firebug is a popular browser extension for web development using Mozilla Firefox. For Apple Safari, you must first select the Show Develop menu in menu bar in Advanced Preferences. Then you can select Show Web Inspector from the Develop menu. You can also use Microsoft Visual Studio. For more information, see How to Debug JScript in Microsoft Dynamics CRM 2011. Debugging tools for different browsers have similar capabilities. Once you have found your library, you can set a break point and recreate the event that should cause your code to run. Consider writing your messages to the console instead. The following is a small function you can add to your libraries that you can use to send any messages you want to view to the console when it is open. Unlike using the alert method, if you forget to remove any code that uses this function, people using the application will not see your messages.